Depending on your needs, Katharine can provide a wide variety of specialized services to care for your photographs. Below is a short list of how she can help, whether your image is vintage or modern, on glass, metal or paper. Image Repair - Paper tears, surface blemishes, glass breakage. These and other damage can affect the look, feel and value of your photographs. Katharine specializes in tear-repair, in-painting, and glass repair. Cleaning – After years of neglect, sometimes an image just needs a good cleaning to restore its original brilliance. Knowing the proper method to remove the grime without damaging the image is critical. 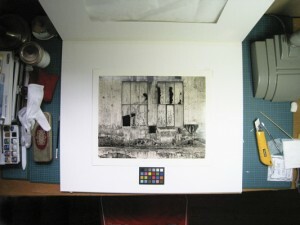 Re-housing – When a photograph’s original case, folder or frame has suffered damage from time and the elements, Katharine can repair or re-house the image. Consultations and Advice – When you discover that box of photos in the back of your Grandma’s closet, you might need some help. Katharine can help determine the type and condition of the photographs in your collection and suggest treatment options. It may turn out that simple surface cleaning will suffice. But you won’t know unless you reach out. Digital Archiving – When you have a one-of-a-kind collection of images (prints, tintypes, Polaroids…), creating a digital backup is a prudent idea. Not only is it prudent, it will allow you to showcase your images in the largest gallery on the planet – the internet. Katherine can create high resolution scans while displaying the care and attention of a conservator. Disaster Mitigation – A pipe burst in the bathroom upstairs. Now water is running down the walls and over your framed photos. What do you do? It depends – what type of photograph is it? – how wet did it get? - how long has it been wet? These, and a host of other factors come into play when dealing with any photographic disaster. Katharine can help.